Back when Cristiano Ronaldo played at Manchester United with the likes of Rio Ferdinand, Wayne Rooney, Anderson, and Nemanja Vidic in the squad, there was a very funny moment which occurred, leaving the footballing world in a frenzy. "Who is the best football player in the world ever?" On this answer, many of the reporters around and fans alongside are heard laughing at the Manchester United sensation. Who might have thought Ronaldo was actually going to become the world's best in years to come? 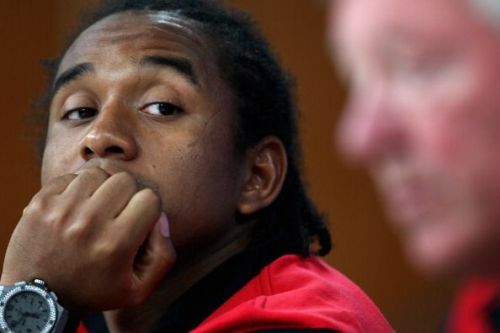 But what left the whole scenario in a sea of laughing chaos, was ex-Manchester United midfielder Anderson's answer. This was a straight post-script to Rio Ferdinand's answer to the question. On this answer, Cristiano and Ferdinand are seen in splits, laughing their hearts out as Anderson follows them in the same. Take a look at the video below. It was an amazing presence of mind by the 30-year-old Brazilian who now plays for Turkish club, Adana Demirspor, having failed to consistently impress in the Premier League after the reign of Sir Alex Ferguson ended at Manchester United. Meanwhile, Rio Ferdinand retired from world football, after successful seasons at Manchester United, and his last season with Queens Park Rangers which was the previous club of his brother, Anton Ferdinand. Now Ferdinand is a pundit at BT Sport, one of UK's leading sports channels. Cristiano Ronaldo, as shown in the video, proclaimed that he is the best football player ever, and has lived up to his own expectations and ambitions, as he went on to win 5 Ballon d'Ors, 1 of them with Manchester United and the other 4 at Real Madrid. Now, the 32 year old Portuguese striker plays for Juventus, as the Turin based club chase their first Champions League trophy in a long long time. Anderson's reply to the question of the best player in the world ever will definitely live on for ages to come and give football fans something to laugh about time and again.